OMA’s New York office has been selected in an international design competition to masterplan 680 acres of mixed use development in Bogotá consisting of government offices, residences, educational facilities, cultural venues and retail. The design was led by partner-in-charge Shohei Shigematsu. The Bogotá Centro Administrativo Nacional (CAN) is positioned as a new civic center, located at the midpoint of Calle 26 Avenue, the city's main axis that has symbolically charted its growth from the historic downtown to the airport and the international gateway of Colombia. With a footprint as large as the National Mall in Washington DC, this new city center will serve as the city's government headquarters, with additional mixed use programs of residential, educational, retail and cultural developments. The new public axis achieves a unified system of green, infrastructural, and programmatic networks. 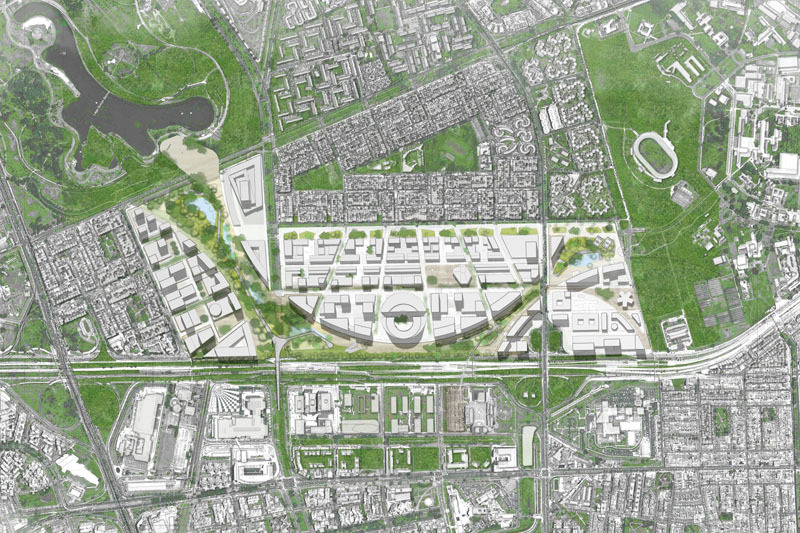 It divides the site into three districts: an office zone that connects to the existing financial district; an institutional / governmental zone that is linked to the existing cultural spaces and recreational parks; and an educational campus connected to the existing university. These districts are unified by a green path that extends the meandering paths of the Simon Bolivar Park to the National University plaza at other end of the site. This park axis will be programmed with cultural attractions and a bike path that will extend to Bogota's highly successful pedestrian CicloVia network. OMA's proposal shifts the city's historic downtown center, which Le Corbusier masterplanned between 1947 and 1951 — an early demonstration of the city's longstanding commitment to urban planning. The CAN masterplan will be the largest built institutional masterplan in Latin America after Oscar Neimeyer's Brasilia, built in the 1960s. The project will be developed in collaboration with local architect Gomez + Castro, mobility consultant Carlos Moncada, financial consultant Oscar Borerro, and sustainability consultant Esteban Martinez.